Well deserved! You earned it! Well, today is the last day of First grade! It seemed only fitting to have a “were-busting-out-of-school” theme. I’d be a liar if I said I wasn’t singing “School’s Out for Summer” while I was doodling this one. Andrew said he has no idea what he’s doing at school today. I do know that he’s got a substitute today, but if Mrs. Moseley (his regular teacher) sees this note, I want to say: thank you for making first grade such a warm experience for Andrew. I’ve enjoyed watching him develop academically this year and can only imagine the amount of effort that it takes to nurture that growth. Thank you so much! 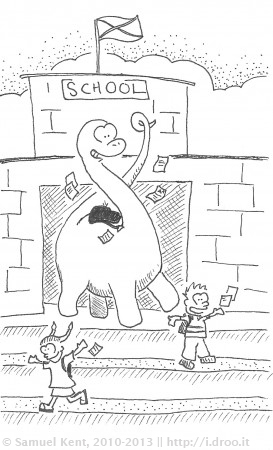 Author Samuel KentPosted on May 23, 2012 August 3, 2014 Categories Lunchbox DoodlesTags dinosaurs, Edmund, kiddos, lunchbox doodles, school, SummerLeave a comment on #440 – Freedom!